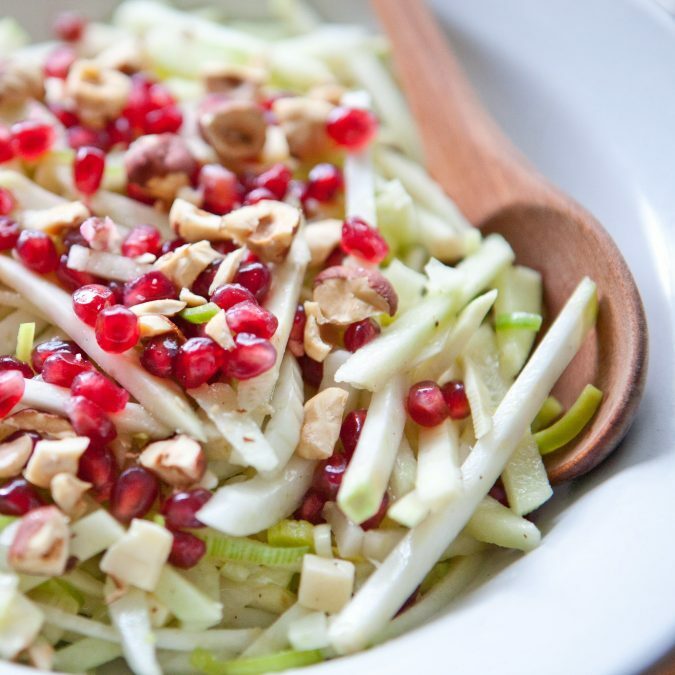 This is the perfect winter salad — bright and fresh with sweet bites of pomegranate contrasted with slightly salty bits of cheese and tart apple. If you’ve never purchased or used celeriac before, it’s not the prettiest root vegetable, but it’s relatively easy to peel and slice right away. And if you want to save yourself a bit of time, a mandolin is really helpful in making the matchbox slices for this salad. Ashley’s recipe did not call for hazelnuts, but I thought they’d add a nice crunch; feel free to use another nut or seed if you’d prefer. In a large bowl, whisk together the lemon juice, salt, and olive oil. Add the celeriac, apple, fennel, leek and Cheddar. Toss well to combine. Transfer to a serving dish and finish with pomegranate seeds, hazelnuts flake salt, and freshly ground black pepper. The salad can be made 4 to 6 hours ahead and store, covered in the refrigerator. Note: For help or instructions on roasting nuts, I like this tutorial.